SLICE AND BAKE COOKIE VARIATION: Prepare dough as above. Divide in half; wrap in waxed paper. Refrigerate for 1 hour or until firm. Shape each half into 15-inch log; wrap in waxed paper. Refrigerate for 30 minutes. * Preheat oven to 375 degrees F. Cut into 1/2-inch-thick slices; place on ungreased baking sheets. Bake for 8 to 10 minutes or until golden brown. Cool on baking sheets for 2 minutes; remove to wire racks to cool completely. Makes about 5 dozen cookies. 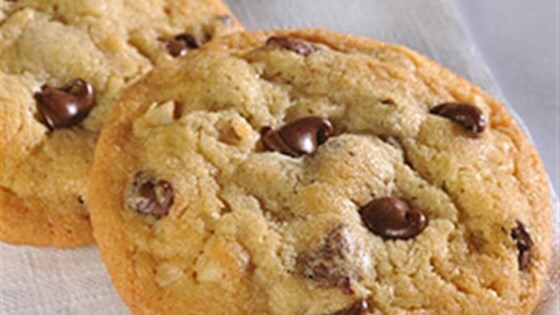 Photograph is exclusive property of Publications International, LTD.
Classic chocolate chip cookie recipe. I leave out the nuts when I make it.